Zee Telugu Apsara Awards 2016: Zee Telugu is one of the most famous channels in Telugu. It celebrates the most prestigious, popular and most rated mega award functions like Zee 10, Zee Kutumbam Awards, Zee Golden Awards, Santosham Awards etc. And now Zee Telugu is coming up with a new innovative concept of ‘Zee Apsara Awards’. This awards honors the beautiful actress in Tollywood and also honors the successful women from different fields of Sports, Defense, Media etc. The winners will be selected on Online Poll and SMS by viewers. The votings for 2016 Apsara Awards has been closed and the winners declared on March 13, 2016. Check out the complete list of Zee Telugu Apsara Awards 2016 Full Show Live Streaming, Nominations & Winners List details from the below article. 2016 Apsara Awards held on March 13 in Hyderabad. Zee Telugu Apsara Awards 2016 will be telecasted on April 17 on Zee Telugu Channel from 6PM Onwards. 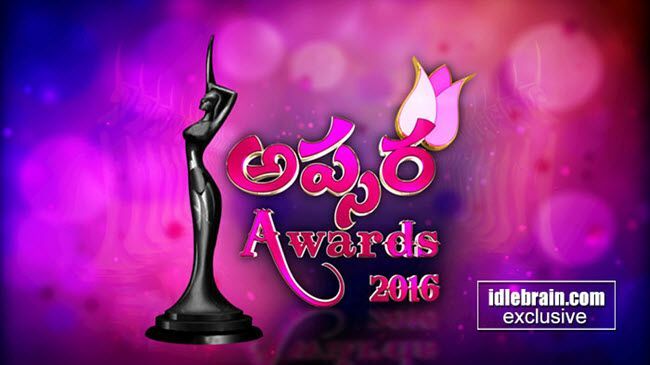 Zee Telugu Apsara 2016 Award winners declared on 13th March 2016 in Hyderabad. Here is the complete and full winners list of Zee Telugu Apsara Awards 2016. Find of the Year – Pragya Jeswal (Kanche). Best female singer of the Decade – Sunitha. Woman Writer of the Year – Kanika (Size Zero). Evergreen Heroine Award – Jayapradha. Best Costume Designer of the Year Award – Rama Rajamouli. Contribution to Indian Cinema (Music) – Usha Uthup. Fresh Face of the year – Hebba Patel (Kumari 21f). Special Appreciation Award – Charmy Kaur. Fashion Icon of the year – Kajal. Most Glamorous Diva of the year – Raasi Khanna. Most Popular Heroine of the Year – Rakhul Preet. Entertainer of Television Award – Suma. Entertainer of the Year – Regina. Rising Star of the year – Lavanya Tripathi(Bhale bhale magadivoy). Most Popular Female celebrity on Social Media – Kajal. Hope you like this Zee Telugu Apsara Awards 2016 Nominations, Winners, Full Show Live Streaming / Online Watch. If you like this, then please share it to your friends.